There is a plethora of information out on the info web regarding transfer cases…what they are, how they became and what they do. We thought it would be beneficial to not re-create what has already been written, but to share what we know and what we have found useful in regards to the piece that separates the two-wheel drive folks from us, the 4-wheel drive folks. Also, rather than get into every variation of t-case out there, let’s just talk about current and recent models, since they are the most common to our readers. So, do you drive a TJ? An LJ? Or is it a JK or JKU? Does it have a 231, a 241? Is it a Rubicon? Do you need and SYE or not? Does the driveshaft matter? These are the most common questions we hear on and off the trail. At one time, a great option was to upgrade the 231 with the Tera-lo 4:1 kit. 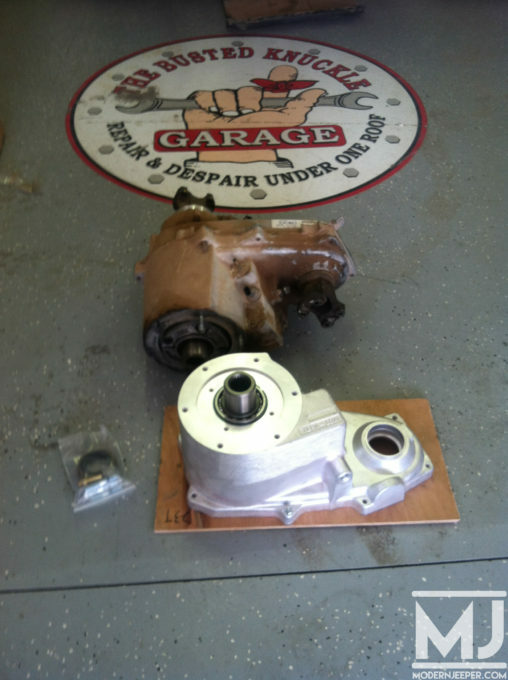 This kit provided a true 5 gear planetary system by replacing the front half of the transfer case. To understand what truly goes on inside the transfer case, just think of it this way as an example. To go from a 1:1 gear ratio to a 4:1 gear ratio, bearings and gears spin 4 times faster. So imagine at 2,000 rpm…the internals of the transfer case are now spinning at 8,000 rpm! Factoring in the torque loads taking place on gears and planetaries all within a chain driven unit…well…lets just say its difficult to retain long term reliability. Released in 2003 and found in the ’03-’06 TJ/LJ’s and ’07-’12 JK/JKU’s (the Rubicon models feature the 241 OR or Rock-Trac), this is the latest and greatest in Jeep transfer case technology. Jeep finally listened to Jeep owners and the aftermarket, and gave the consumer the transfer case they have been building from the 231J for years. While the NV241 still retains the same 2.72:1 low range as the 231, the 241 OR features a 4.0:1 planetary reduction, a heavily ribbed and reinforced aluminum case and a fixed yoke rear output. The front drive is chain driven and offset to the driver’s side while the rear output is centered. 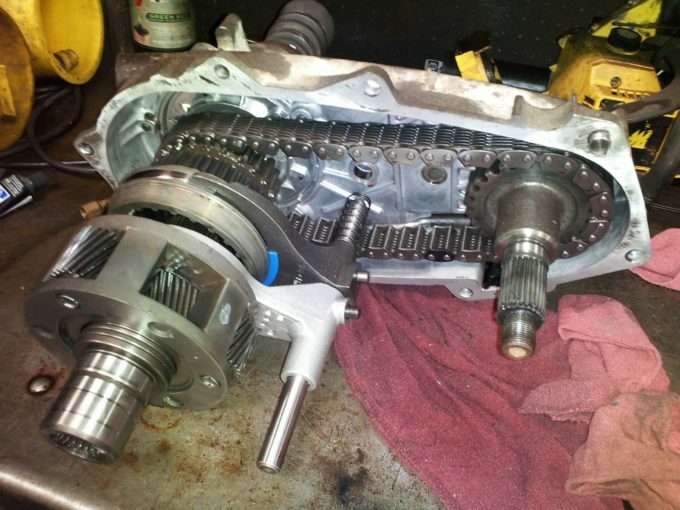 This transfer case was originally designed to withstand the torque output of the Cummins Diesel, as such is one of the strongest ever installed in a factory Jeep. They continue to be difficult to find inexpensively, but are still a viable option to swap into a non-Rubicon model Jeep. Shown on the right is the Rock-Trac, which is known as the 241OR (OR stands for off-road). The non-Rubicon model is labeled 241J. What is a Slip Yoke Eliminator and why should they be used? SYE stands for Slip Yoke Eliminator. The Slip yoke is the yoke that slides over the output shaft of the transfer case. This is the yoke that the rear driveshaft connects to at the Transfer case. The SYE kit replaces the stock slip yoke and housing with a sealed housing and a fixed flange or yoke. This fixed flange or yoke is what a new CV style driveshaft will bolt up to. A CV (constant Velocity) shaft uses two U joints instead of a single one and this allows for much steeper angles. These shafts also utilize a two piece design that allows for suspension travel by allowing the shaft itself to compress and extend verses the yoke sliding on the output shaft. 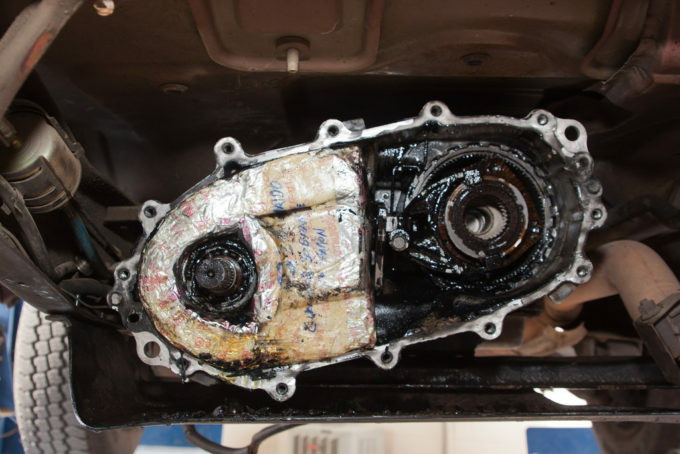 The sealed output now also allows for the rear driveshaft to be removed from the vehicle and not allow the transfer case fluid to empty out of the transfer case. When should a SYE be used? If you’re fortunate enough to have the NP241OR Rock-Trac transfer case, you don’t need a SYE, since this transfer case already has one from the factory. The stock rear driveshaft is a fixed length unit that relies on the slip yoke to adjust when the suspension travel. When lifting a TJ, the angle between the rear axle pinion and the slip yoke become much greater. The factory setup was not intended for these variations in lift. The angle difference will be most noticeable in the fact the slip yoke will be pulled further out of the housing than before the lift. The differences in angle can be attributed to several things, but they all revolve around this center point, the length of the rear driveshaft. You will hear various things from various people about what size lift can be ran without a SYE. The key here is to recognize the differences between their TJ and yours. What are some of the harmful effects of not using a SYE? 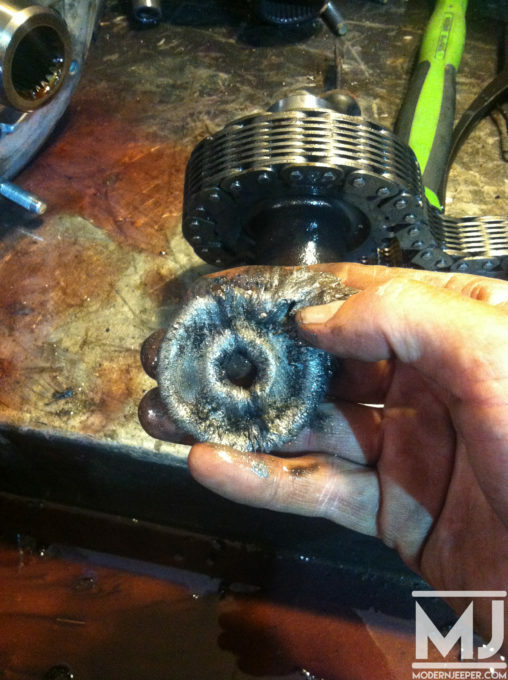 The difference in the angles put a strain on the output shaft. This places load on the transfer case bearings and the seals on the output shaft. Another, more obvious problem, are the U joint ears of the driveshaft making contact with the slip yoke as the driveshaft spins. This will make for a noticeable clanking noise and hard vibration. A transfer case drop will clear that problem up, as well as a high clearance extended slip yoke, but it will not correct the strain on the output shaft. What are other positives does the use of a SYE provide? As mentioned before the ability to remove the rear driveshaft if damaged and drive off a trail under the power of the front axle is a major plus. If you run a stock front driveshaft with a SYE, you can carry a spare for both the front and the rear driveshafts. Which SYE do you recommend? If you’re like the majority of us however and have the NP231 transfer case as found in all the other TJ and LJ Wrangler models, there are various options in regards to SYE kits, but one of the most popular and well regarded is the Advanced Adapters SYE. What if I have an LJ? Lucky you! 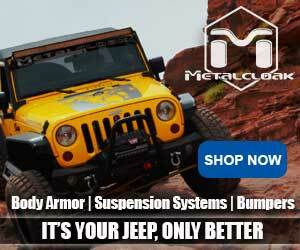 The LJ in most cases is fun up to about 4-4.5″ of lift without a SYE or double cardan (CV) driveshaft! That’s one of the benefits you get from the LJ with it’s longer wheel base… much less extreme driveline angles. Through the analysis of other successful transfer case designs, we have manufactured a rugged, all gear-driven transfer case. Combining the latest in CAD/CAM technology and years of in-house CNC machining capabilities, the Atlas transfer case is sure to bring you the utmost in dependability and performance. The Atlas is available for both left and right hand vehicle applications with centered rear differentials. The solid, one-piece case design is manufactured from 356-T6 heat-treated aluminum alloy. This material is also used for the structural access cover and all other exterior components. The massive gears are helical cut and synchro-equipped for quiet performance and “shift-on-the-fly” capability. These gears are supported by needle bearing elements, precision matched to strong 8620 shafts. The ruggedly designed output shafts are amply supported by large taper bearing sets. The Atlas also features a unique twin stick design to deliver crisp, quiet operation. 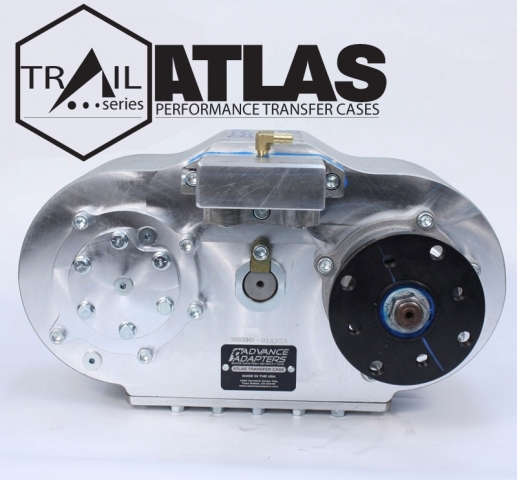 The Atlas transfer case offers you the ability to customize the transfer case to your vehicle. 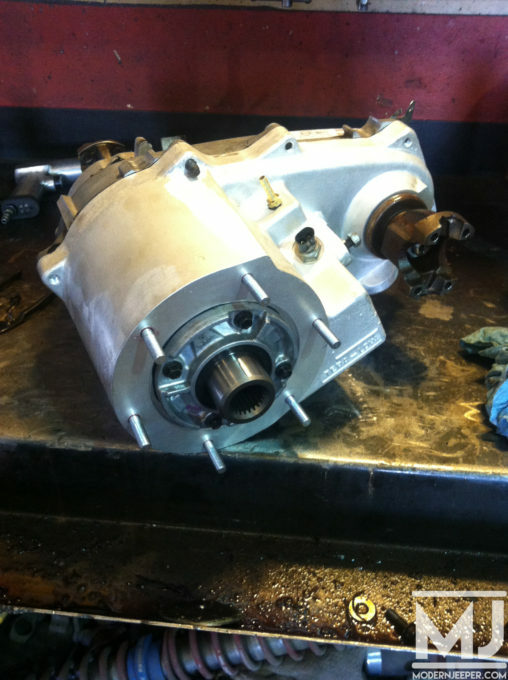 We offer several upgrades, options, and different configurations for this transfer case. Atlas the ultimate gear driven transfer case. The 4SP has essentially two parts. The first is the reduction housing. This housing holds a planetary assembly that has a gear ratio of 2.72:1 when in “low” range, and a 1:1 in “high” range. It has one shifter coming out of the top to select the desired range. The planetary is not a synchronized shift-on-the-fly design and must be operated when the vehicle is stopped. (The main case still retains the shift-on-the-fly capability just like the standard Atlas). The reduction housing shifter is designed for a cable shifter. The second part of the 4SP may look the same as the standard Atlas, but it does have some differences. The main case of the 4SP is the same raw casting, but has some machining variations to make it into a 4SP. The main case functions independently from the front reduction housing and retains all of the normal Atlas features (front and rear outputs controlled independently, and the “front only” option). All of the gears are the same. The front output uses all of the same parts along with the cluster. The strength of this unit is not an issue. We use a planetary assembly that was originally run in a NP241-HD transfer case. The six planetary gear setup has proven its durability and has been used in countless heavy-duty vehicles. Other attributes to the planetary assembly include a very quiet operation, easy shifting, and low rolling resistance. When all of this is put in front of a legendary Atlas Transfer Case, you get the best combination of gear ratios and reliability. In researching for additional information, I came across this image…so, as a final thought, if this is a use you need for your transfer case…well, the atlas is probably not a good solution for you…just saying. The pictures was from US Border and Customs agents who discovered the illegal drugs coming into the US.